The MS2721A is the first fully-functional handheld spectrum analyzer designed to conduct highly accurate analysis on the new wave of wireless signals, including 802.11a, 3G, ultra-wideband, and WiMAX. The next-generation of Anritsu''''''s popular Spectrum Master family. The MS2721A is a small and easy to use handheld spectrum analyzer with unprecedented measurement capability for applications up to 7.1 GHz. Weighing in at less than 7 pounds, it is equally at home on the engineering bench and in the field. The spectrum analyzer has phase noise of at -100 dBc/Hz @ 10 kHz offsets, best in its class typical DANL of -153 dBm at 1 GHz, resolution bandwidth (RBW) range of 10 Hz to 3 MHz and video bandwidth (VBW) range of 1 Hz to 3 MHz. 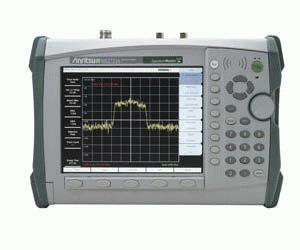 It also has the fastest sweep speeds of any spectrum analyzer in its class.